Help out the Glorious Expedition for Nord Cultural Exchange. "Envoy Rigurt, I regret to inform you that you'll need to wait a few more days." Rigurt the Brash, leader of the Expedition for Nord Cultural Exchange, has asked for my assistance. I've agreed to trade a Nord book, clothes, and relic for similar Dark Elf items. Talk to Rigurt the Brash. Trade the Nord goods for equivalent Dunmer items. Rigurt the Brash can be found in the amphitheater on the northwestern side of Mournhold's City Center. Like everyone else entering Mournhold, Rigurt and his group have been forced to wait for a meeting with the city registrar, but he has grown impatient. He asks you to trade Nordic items for Dunmeri items to facilitate his cultural exchange, and gives you three leads which you can pursue in any order. The closest lead is clothing merchant Iirila Maleran outside the armorer's tent in Mournhold's Royal Bazaar. Upon seeing the Nord clothing you want to trade, Iirila notices it is made of baby mammoth fur, which is illegal to export from Skyrim, and becomes considerably more interested in bartering with you. Before you have a chance to raise any concerns about trading contraband, she takes the Nord clothing and gives you a bundle of display clothing which she was using to test experimental dyes. Next, travel to Shad Astula and head to the docks, to the stall of bookseller Adras Sarethi. Adras recognizes the book you want to trade as an original edition of "The Art of Love and Swordplay" by the Nord poet Fjokki, a bard of "exceptional imagination but decidedly limited skill." Although the book is common and has no value as literature, as luck would have it Adras is a fan of Fjokki and is willing to trade. Choose between a book on Dunmer culture and etiquette called "The Dapper Dunmer", or a book of Dunmer insults, taboos, and social blunders called "The Dunmer Dunce". Lastly, travel to Muth Gnaar and seek out the monk Hamen Athren at the refugee camp to the west of the monastery. Already agitated due to Muth Gnaar's disarray, Hamen almost rejects the "Heart of the Wild", a seemingly mundane dried animal heart, you wish to trade. All Hamen offers you is a loaf of stale bread, which he says to tell the Nords is "the Holy Loaf of... oh, I don't know. Make something up. Exaggerate. Nords like that." With the exchanges complete, return to Rigurt in Mournhold. The Nord is overjoyed at the assortment of items you have obtained and rewards you for your efforts. 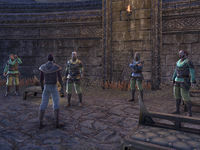 He and his cohorts change into the brightly-colored Dunmer clothing you brought just as Registrar Seleth arrives and informs the group that their paperwork will take a few more days to complete. As their task has been completed, however, Rigurt scoffs at the news and leads the Expedition for Nord Cultural Exchange out of the city. The registrar trails after them, bemoaning the additional paperwork their abrupt departure will create. I can find the items Rigurt wants in Muth Gnaar, Shad Astula, and the crafting district of Mournhold. I may have to convince the Dark Elves to trade, however, as they probably aren't aware of this Nord tradition. Finishes quest I made the necessary cultural exchanges. I should bring the Dunmer book, relic, and clothing back to Rigurt the Brash. This page was last modified on 1 December 2017, at 19:51.